Remove seeds from cardamom pods and transfer to a frying pan with black peppercorns, juniper berries, mustard seeds, and white peppercorns. Toast over medium-low heat for approx. 5 min, or until fragrant. Toast for approx. 5 min., or until fragrant. Let cool. 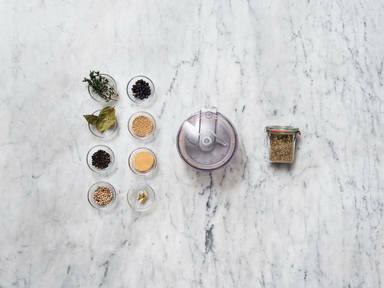 Add leaves from thyme sprigs, bay leaves, cane sugar, and cooled toasted spices to a food processor. Blend to a powder and store in an airtight jar in a dark, cool place. Enjoy!